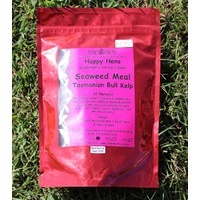 Seaweed Meal - Kelp. All natural! No artifical colours, flavours or preservatives. Over 70 essential naturally-balanced elements, minerals and amino acids including vitamins A, B1 and E, coppper, cobalt, magnesium, iron and natural iodine. This product has a powerful prebiotic like effect which may have beneficial effects on poultry by changing the microorganisms present in the gastrointestinal tract. Poultry Dosage: Sprinkle one teaspoon into two kilograms of feed 3 times per week. 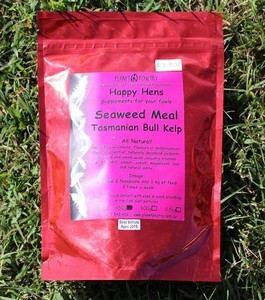 Natural Supplement, Poultry, fowls, bantams, chooks, chickens, chick, hens.